Real-world experience & earnings (cooperative education): Last year, UC students earned a collective $66 million by alternating semesters spent in school with paid professional work experiences related directly to their majors. In fall 2017, first-year Engineering students entered with an average composite ACT score of 28.07, an average ACT Mathematics score of 28.68, an average SAT composite of 1313, and an average SAT Mathematics score of 665. Students launch history-makingrockets from the Californiacoast; dive underwater to help NASA train astronauts; turn fryer fatinto fuel; and develop artificial intelligence able to beat tactical expertsin US Air Force combat simulations.These are the anything-but-routine, real-world challenges and opportunities students find at the University of Cincinnati in the Engineering and Science disciplines. UC is the university of choice forstudents who want the benefits ofrigorous academic programs combined with the imperative to invent in the classroom and beyond.Putting education into action is the cornerstone of UC’s academic strength. In classrooms, in research labs, and with employers around the globe, UC Engineering and Science students are frequently tapped to take on big jobs involving real trust, real responsibility—and real money. That’s because an international array of about1,400 employers annually partner with the University to support students and their work. This creative drive in and beyond the classroom stems from UC’s national and international preeminenceas the cradle of cooperative education, or co-op. The idea that students should alternate academic semesters with paid professional work directly related to their majors had its global founding at UC more than a century ago. 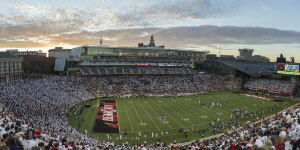 Today, UC houses the largest co-opprogram at any public university in the US. It’s the third-largest co-op program in the world, and UC consistently places among the very top of such programs as ranked by U.S. News &World Report. Via cooperative education, UC students earn a collective $66 millionannually, working for local, regional,national, and international employers, including Apple, Boeing, Disney, Duke Energy, General Electric, Honda, Kroger, NASA, Procter & Gamble, Toyota, and many others. 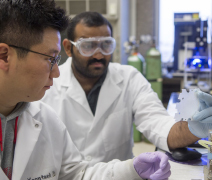 In addition, UC Engineering, Science, and Technology students are able to pursue entrepreneurial efforts—in partnership with fellow students from other disciplines—with support from the UC Center for Entrepreneurshipand Commercialization and the Entrepreneurship Bearcat Launchpad, the nation’s first student-led business accelerator. 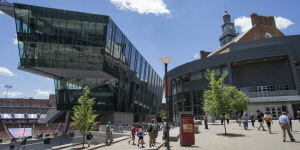 These efforts go hand-in-hand withUC’s cutting-edge campus, which TheNew York Times called the “most ambitious campus design program in the country.” This academic setting, withits A+ architecture and state-of-the-artlabs, has been designed to arouse intellectual curiosity and prompt a healthy social culture. People thrive on UC’scampus because it’s a place they canlearn, problem solve, and collaborate. Throughout their academic careers, UC students earn many external honors and awards, including Fulbright, Truman, Goldwater, and Schwarzman Scholarships, as well as grants and research project support frominternal and external entities as varied as the National Science Foundation, US Departments of Defense and Energy, the National Geographic Society, Robert Wood Johnson Foundation, and many others. Both undergraduate and graduate students receive funding and mentoring to pursue researchthrough specialized programs like ROSE (Research, Observation, Service, and Education Experiences), WISE(Women in Science and Engineering),and SURF (Summer Undergraduate Research Fellowship). Such opportunities allow students to contribute directly to innovation, build a meaningful portfolio, and engage with faculty and other thought leaders outside the classroom.